The Multi-Four Ball Test Machine incorporates both the Four Ball EP (extreme pressure) and the Four Ball Wear testers into one computer operated machine. Increasing demands in Tribology testing have required the need for higher accuracy of controlled variables, increased reproducibility and repeatability, more dynamic ways to uncover data, and more control capacity. This new machine is based on a revolutionary new concept, which linearizes the specimen-applied load in both wear and extreme pressure thresholds. This linear loading concept broadens the machine's capabilities, accuracies and the spectrum of test evaluation. Test variables include: load, RPM, time, and temperature. The M-4 can run other specimen configurations. PTI, Inc. latest specimen geometry is referred to as the Twist Compression Test for evaluating forming fluids. This adapter can also be used as a thrust washer test for evaluating a wide range of lubricants and materials. The Epsilon Linear Precision Test Machine, otherwise known as the Epsilon, was developed to test the expanded demands of todays lubricants. The Epsilon is new technology which significantly improves the evaluation of friction, wear, and extreme pressure properties of fluids. This new machine is based on a revolutionary new concept, which linearizes the specimen applied load. This linear loading concept broadens the machine's capabilities, accuracies and the spectrum of test evaluation. The Epsilon can run other specimen configurations. We have been using PTI’s Multi-Four Ball Test Machine and Epsilon Linear Precision Test Machine for over 10 years. PTI’s instruments have provided us with new product developments that we could not have achieved any other way. These are very accurate instruments that provide reproducible results and have saved us a considerable amount of time and money with our R & D projects. In addition, the graphing capabilities of PTI’s wear machines have greatly enhanced our product presentations to our customers. Last year we purchased an additional Multi-Four Ball Test Machine to double our four ball testing capacity and expanded the M-4’s multiple capabilities to include Twist Compression testing. Paul Evans’s expertise in designing these instruments has greatly enhanced our lab testing capabilites. 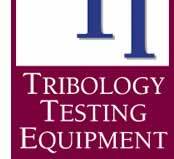 PTI is one of the most knowledgeable tribological and analytical companys in our industry. We recently purchased PTIs Multi-Four Ball Test Machine and have been very happy with the results. PTI has responded to any and all of our questions about the machine and the in-house training they provided has been very helpful. PTI is the only company that has come up with any innovations in lubricant testing equipment during the past 15 years. The fact that PTIs machines are fully-integrated with a computer system gives us real-time data acquisition. This allows us to be more efficient with our time and provides us with data that can be used for both marketing and technical purposes. Tom Willey, President, Tomlin Scientific, Inc.
We acquired a Multi-Four Ball Test Machine from PTI just over a year ago. The data capturing and recording capabilities coupled with the versatility and ease by which we can adjust test conditions have already established it as an invaluable tool at Elco. The M-4 simply generates more data that is also more accurate and relevant to our research. It enables us to better replicate the demanding conditions that lubricants experience in the field.